Cleanliness, it turns out, has been one dirty trick. One reason early-20th-century Americans ramped up their weekly baths to daily showers is that marketing companies capitalized on the insecurities of a new class of office drones working in close quarters. As Gizmodo wrote last week, to sell products like "toilet soap" and Listerine to Americans, "the advertising industry had to create pseudoscientific maladies like 'bad breath' and 'body odor.'" The trade association wanted Americans to wash quite unwittingly after toilet, to wash without thought before eating, to jump into the tub as automatically as one might awake each new day. And so we did. A Reddit user recently polled 562 people and found that most men said they showered daily. Women's bathing rituals were more diffuse, but about 60 percent preferred to shower three, four, or five times weekly. Now is the dawn of a new, more pungent era, though. People are snapping up dry shampoo and No-Poo and coating themselves in bacteria. Dr. Sanjay Jain recently told Jezebel that "showers don't need to be too hot, or too long, and you should always pat dry, rather than rub, to avoid irritating your skin." One family went six months without using soap and raved about the results. But as it turns out, Americans aren't alone when it comes to having overdone it with too-frequent showers and shampoos. A Euromonitor poll from July found that Americans are fairly average when it comes to hygiene. 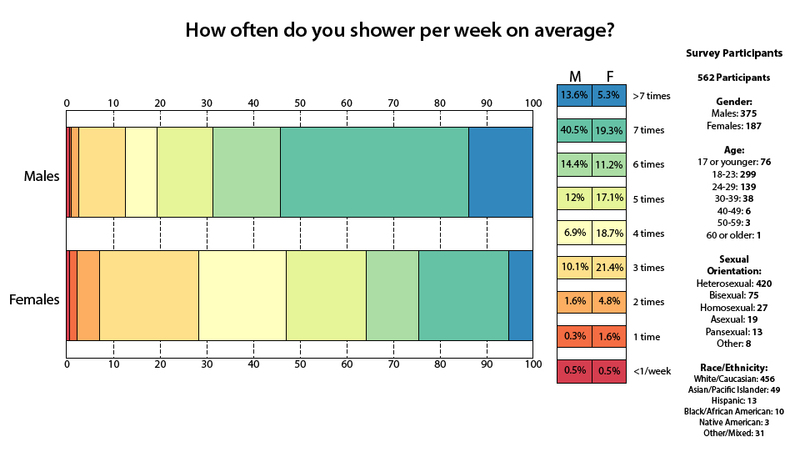 Among the 16 regions surveyed, Americans attested to showering more frequently than the Chinese, Brits, and Japanese, where respondents said they take about five showers per week, but not nearly as often as people in Brazil and Colombia, where people seemingly sometimes take more than one shower per day. Perhaps the warm climates play a role—though that wouldn't explain the habits of balmy, relatively-infrequently-bathing Turkey and Spain. It's interesting, too, that in most countries people don't shampoo every time they shower. Mexicans and Japanese people come closest to fully sanitizing their hair each time. In other domains of grooming, gender equality is nowhere to be found. The SCA study found that among all countries, 84 percent of both men and women said "the ideal woman" shaves her legs. Seventy percent said it was important for her to wear perfume, but only 51 said the "ideal man" wears cologne. The ideal woman also apparently "has long hair" (repeat: not on her legs), but she "does not wear it up." Meanwhile, the top tasks required of "the ideal man" were to cut his hair and nails short. Sounds pretty onerous. When SCA compared the results across cultures, they found that "Russian women have to contend with the biggest demands for the attributes of beauty—jewelry, makeup and shaved legs—from those closest to them. The survey also indicated that Russian women value these attributes the most for their well-being." Comrades, it's time to take a cue from our sisters in Sweden and start living the stinky, hairy, unadorned life.